Last week, the Wall Street Journal reported some of Xiaomi's financial metrics from 2012 and 2013. The two most interesting data points were the proportion of Xiaomi's revenue from services (~1%) and their sales and marketing costs. While we already know a fair amount about Xiaomi's services ARPU, the business still accounts for a small portion of total revenue. And even though their hardware business is profitable, their valuation is based on the long-term potential of their content & services business (not app distribution). Therefore, it should come as no surprise that Xiaomi is looking to invest close to $1 billion in localized and video content in order to boost this business. Meanwhile, Xiaomi will rely on their hardware business to sustain their growth. That seemed to work well in 2013, as riding down the cost curve generated more than $500 million in profit for the company off the sale of less than 20 million devices. Xiaomi has certainly been an innovator in marketing and distribution, and the chart above is a testament to that fact. 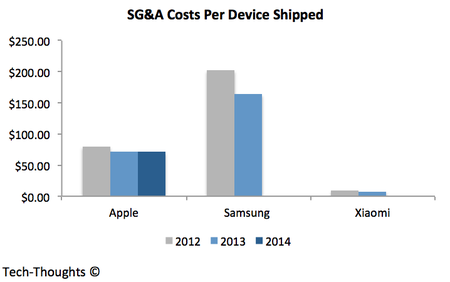 Apple and Samsung spend ~$70 and ~$160 respectively in SG&A expenses per device shipped compared to Xiaomi's $7. Normally, startups crank up marketing investment in order to drive growth, leading to a spike in expenses before growth catches up. Interestingly, Xiaomi's per device marketing costs actually decreased from 2012 to 2013 as sales grew from ~7 million to ~20 million. Of course, Xiaomi shipped nearly as many devices in Q3 2014 (18 million) as it did in all of 2013. With sales momentum showing no signs of slowing down, it will be interesting to see if they can maintain their cost structure at scale.